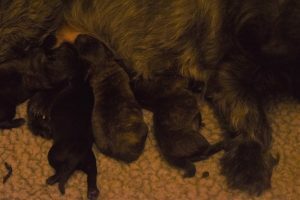 April 14, 2019: Tessa is whelping her puppies. So far, she has had three females. One is definitely black. The other two may be brindle. Where are the males? This year, I have been heavy on females and few on males. She had one male while I was feeding the horses. 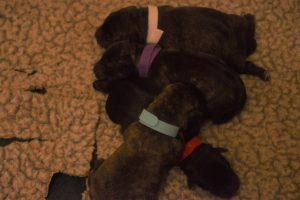 In the end, there are two brindle females, one black female, and one brindle male. I will get Velcro collars on them soon. They are all nursing well. It helps having Tessa’s hair removed.